On the 30th of January 2018, ABYSS held its last meeting with the members of the Supervisory Board to assess the results of these four years of work. The meeting was welcomed by the “Maison de Heidelberg”, the Heidelberg’s House in the historical centre of Montpellier. Despite the emotion to reach the ABYSS finish line, all members of the board were very satisfied with the progress made by the trainees, the fruitful collaboration within the network and of course the qualitative ABYSS scientific results. From 28 to 30 September 2017, the participants to the ITN Abyss project met in Southampton, UK at the National Oceanography Center Southampton (NOCS). 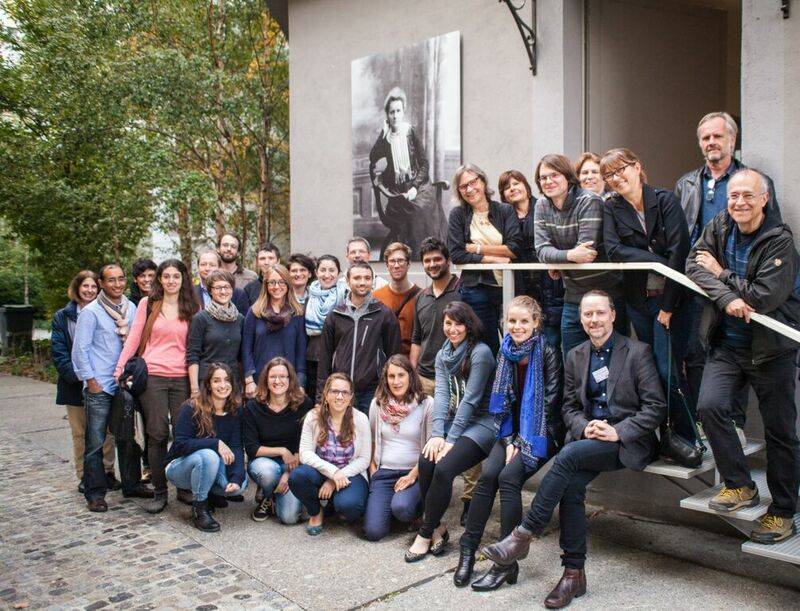 This was the last official meeting from the project that gathered trainees, researchers and associated partners. On Thursday the 28th of September 2017, M.Andreani, keynote speaker, gave a lecture on “Fluid-rock interaction at Oceanic core complexes”, followed by two plenary sessions (“Fluid, rock and microbial interactions and mineralisation in the ocean crust” and “Melt Rock Interactions”) where the trainees had the chance to present their work. A second keynote speaker, M.Bickle, gave a lecture on “Long term climate: Chemical weathering the negative feedback?” and closed this first intense day. On the second day of the workshop, D. Teagle and J.Pearson guided the group for a tour of the NOCS Autonomous Systems and Sensors. In the afternoon, J.Matter, H.Harris and J.Coggon, presented an update on the Oman Drilling Project, followed by the distinguished lecture “Feedbacks in mineral carbonation and hydration: review, theory and lessons from Oman”, by Peter Kelemen. On Saturday the 30th, the trainees within the “Hydration and Carbonation of Mantle Peridotites” session presented their work and two keynote speakers gave lectures: R. Tribuzio, “Interplay among hydrothermalism, magmatism and tectonics in exhuming lower oceanic crust”, and G. Früh-Green, “Serpentinization and life: Insights through ocean drilling”. ABYSS Fellows and senior scientists along with external participants gathered on the 5th of April 2017 for the Ronda peridotite field trip. It took place in the western Sierra Bermeja forest. The ABYSS Granada Meeting was held in Granada, Spain at the IACT institute from 6 to 7 April 2017. The meeting started with an outreach activity called “My Research Project in 180 seconds”. Following the model of the 3 minutes thesis, ABYSS Fellows and PhDs students from IACT presented their research projects in a fun and comprehensible way for a broader public. As soon as the chronometer started, each student had 180 seconds to talk about her/his thesis and explain the slide or the movie that accompanied the presentation. And there was no chance to speak 181 seconds since the bell always stopped the students exactly on time! After carefully listening to the 20 speakers, the public voted for its two favorite presentations. The winners received a MRP180 diploma and a nice prize. This activity was followed by four discussions sessions: “Abiotic and biotic forms of carbon and carbon mineralization”, “Melt-rock interactions”, “Cooling and hydrothermal alteration of the oceanic lithosphere – Serpentinization and carbonation” and “Cooling and hydrothermal alteration of the oceanic lithosphere – High T° processes”. The discussions continued on the second day of the meeting with two other themes: “Experiments: hydrothermal and magmatic” and “Tools for structure characterization: X-tomography, EBSD: What is new since the project started?”. At the end of the discussions, the Work Package 3 and 4 leaders made a point on the great progress made since the beginning of the ABYSS project. On Saturday the 8th of April, the Sierra Nevada Serpentinites field trip took place. It aimed to visit unique outcrops recording high-pressure dehydration of antigorite-serpentinite to prograde chl-harzburgites in paleo-subduction terranes of Sierra Nevada. The ABYSS Workshop n°3 was held in Oslo, Norway at the Oslo Science Park “Forskningparken” on 1-2 September 2016. All ABYSS young researchers along with the guest trainees presented posters and addressed the audience about their scientific progress. During the meeting six Young Scientist Advisory Board (YSAB) took place and the concerned Fellows had the chance to discuss with the senior researchers about their work and training activities. On the first day of the workshop, H.Austrheim made a speech about “Fluid induced processes in the Feragen Ophiolite – from the ocean floor to the critical zone”. On the second day, Olivier Rodriguez from Voxaya made a professional focused presentation entitled “From invention to Innovation” where he explained to the ABYSS Fellows the methods one should follow to create a successful company based on a scientific innovation. The workshop was followed by a field trip to Roros from 3 to 6 September and by the short-course n°5 on “Microstructures and modelling reaction driven fracturing” from 7 to 9 September 2016. The ABYSS Mid-Term Meeting n°2 was held in Sestri Levante, Italy on 7-8 April 2016. It was the occasion to hear presentations by senior scientists and young researchers. Riccardo Tribuzio and Marco Scambelluri were present as special guests and proposed very interesting presentations, mainly on the Ligurian Ophiolites that were the central interest of the coming field trip. The ABYSS fellows organized round-table discussions on “REE Partitioning” and “Reaction sequences and related microstructures” that allowed the senior scientists and the young researchers to exchange point of views and ask questions on these topics. During the meeting seven Young Scientist Advisory Board (YSAB) were organized and the fellows had the chance to discuss about their scientific progress, training activities and Individual Research Project progress reports. The meeting was followed by a field trip of two days, 9-10 April 2016, in Liguria. The ABYSS workshop 2 was held at IPGP on October 13, 2015. It was the occasion to organize one round-table for each scientific work-package (WP3 & WP4) animated by the trainees involved in these work-packages. The senior scientists met to discuss and write a feedback on each ESR project (progress, decisions and recommendations) on the basis of the presentations from the previous day. The workshop ended with a feedback on the mid-term review meeting and announcements in general assembly. The Mid-Term Review meeting of ABYSS was held on October 12, 2015 at IPGP in Paris. This meeting allowed the network participants and REA representative to discuss the project progress and all questions concerning the project. During this meeting the external expert of REA evaluated the implementation of ABYSS, with particular attention to the training activities and networking aspects including activities across different sector. The meeting began with a brief presentation by the REA external expert about REA, MSC ITN and the aims of the mid-term review meeting. Then, the ABYSS coordinator presented the network and a report on the progress achieved at month 18 in all the aspects of the project. It continued with the young researchers’ oral presentations, which were concluded by an open discussion between the fellows and the REA external expert. The meeting ended with a feedback by the REA external expert and an open discussion with all the network participants that continued during the dinner. Overall this meeting was very positive. Discussions were effective and this constructive dialogue provided a lot of feedback to both the consortium and the REA that will be useful for the successful continuation of the project. The ABYSS short-course 3 took place at the IPGP (Institut de Physique du Globe de Paris) from the 5th to the 9th October 2015. This course, led by Prof. Dr. Bénédicte Ménez, focused on advances in imaging and analytical techniques for (bio) petrology. The topic was addressed by both lectures about X-rays, Infrared and Raman spectroscopy and by practical sessions on Raman, FTIR and image analysis with softwares as ImageJ and ENVI. The trainees spent one day at SOLEIL Synchrotron where they attended lectures on hyperspectral imaging, infrared spectroscopy, X-ray absorption spectroscopy and X-ray fluorescence and visited the DISCO, SMIS and LUCIA beamlines. The Short course ended with the preparation and animation of a Fête de la Science event at IPGP. ABYSS trainees prepared three different workshops for high school students: Ocean drilling, Draw me a volcano and Geodynamics. The ABYSS short-course 2 combined with the ECORD Summer School 2015 “Ocean crust processes: magma, faults, fluxes, and life” took place at MARUM, University of Bremen (Germany) from August 31 to September 11, 2015. 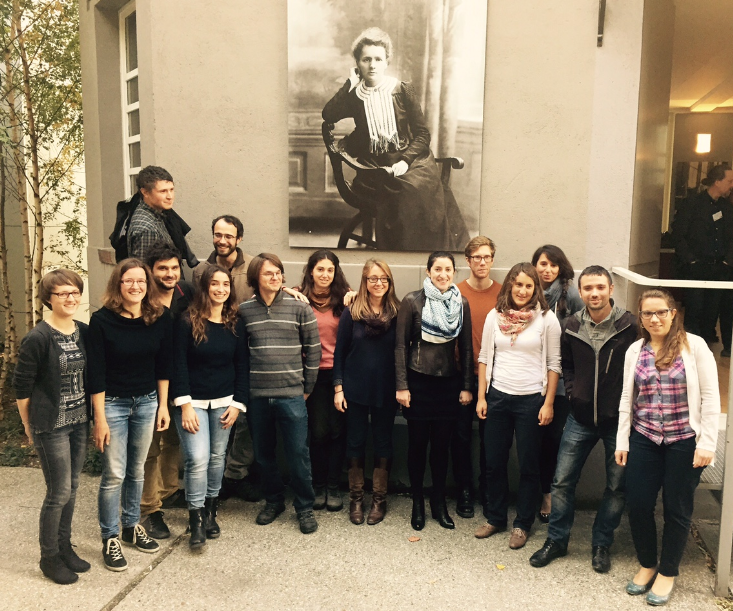 The 12 ABYSS ESRs participated to this short-course together with 11 young scientists. They were prepared for future participations in expeditions and for research work on mid-ocean ridge processes by doing lab exercises on IODP-style shipboard methodologies (“virtual ship”) and by benefiting from interactive lectures by world-leading scientists in the field of mid-ocean ridge research, including several ABYSS senior scientists (W.Bach, C.Garrido, M.Godard, B.ildefonse, J.Koepke, B.Menez and D.Teagle). The summer school took advantage of the unique and integrated facilities offered by the IODP Bremen Core Repository and the MARUM laboratories. It was also a possibility for the ABYSS trainees to give a short presentation introducing their own research work. The ABYSS short-course 4a took place in Hannover on 25th, 26th and 30th of May 2015. The main goal of the course was the introduction of the trainees to various methods of experimental petrology. It was led by Prof. Dr. Jürgen Koepke and Dr. Renat Almeev from University of Hannover. The course was characterized by many activities including lectures, practical work and computer simulations. The lectures dealt with a wide range of existing tools in experimental petrology focusing on their uses and characteristics. The trainees had the opportunity to familiarize with the experimental techniques by visiting and operating the facilities of Hannover University, practicing steps for sample preparation and discussing peculiarities of the analysis of experiment results. During the last day, the trainees used a number of software programs with the aim to model fractional crystallization processes in magmatic systems. 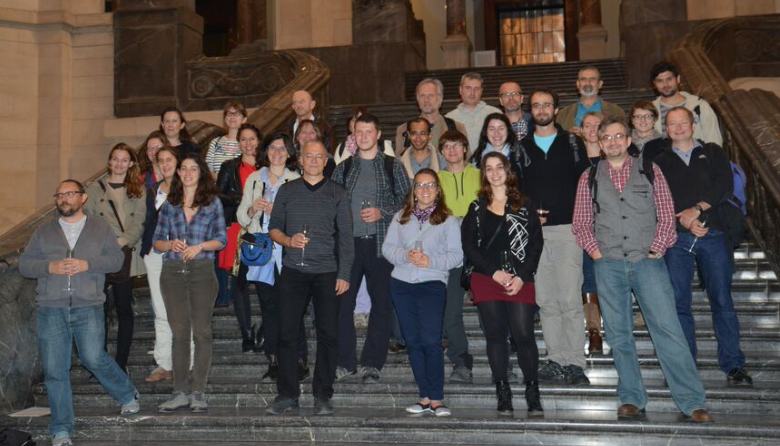 The first ABYSS mid-term meeting took place in Hanover from May 27th-29th, 2015. Thanks to the active participation of ABYSS senior scientists and of our distinguished guests Peter Kelemen and Gretchen Früh-Green, the fellows enjoyed lectures on several keys topics such as the formation of oceanic lithosphere, serpentinization, carbonation reaction and processes, reaction-permeability relations, oceanic hydrothermalism and exciting ongoing projects (IODP Atlantis Massif and ICDP Oman). Half a day was dedicated to the preparation of upcoming outreach activities, the launching of the trainees driven SeaRocks Blog and the ABYSS day organized at IPGP for La fete de la Science in October 2015. This meeting was also the occasion for the ABYSS fellows to present the progress in their respective research projects and to discuss the next steps with the scientific audience. As for the ABYSS first workshop, the scientific discussions were fruitful and the collaboration strategies were strengthened. 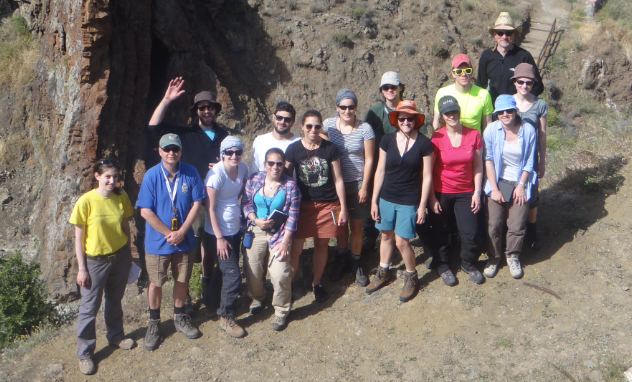 The first ABYSS short-course was a field-trip to the Troodos ophiolite (Cyprus),which samples remnants of an ancient oceanic lithosphere. The main objective of the course was to study in the field the processes driving the formation of the ocean crust and its hydrothermal alteration. It was led by Profs Damon Teagle and Tim Henstock from Southampton University from April 26th to May 2nd, 2015. The course was developed in two main activities including field observations, and calculation exercises. The field excursions were organized in the Troodos mountains, where the students had the opportunity to observe and describe the outcrops of dykes, pillow lavas, gabbros and mantle rocks. During the week ABYSS Trainees had the opportunity to visit two copper mines. The calculation exercises focused on the thermal aspects of mid ocean ridges and on fractional crystallization in magma chambers. The first ABYSS workshop took place in Montpellier from November 23rd-27th, 2014. This meeting allowed fellows to meet one another as well as the senior scientists. Two days were dedicated to scientific discussions. Details of the scientific projects were discussed, ideas were shared and collaboration strategies were defined. The ABYSS fellows enjoyed a one-day training in scientific communication towards general public. The meeting ended with a visit of the Mediterranean IFREMER Center of La Seyne-sur-Mer. For more information about the ABYSS fellows’ impressions about this first ABYSS workshop, do not hesitate to read their articles about the meeting and the visit of the Mediterranean IFREMER Center of La Seyne-sur-Mer! 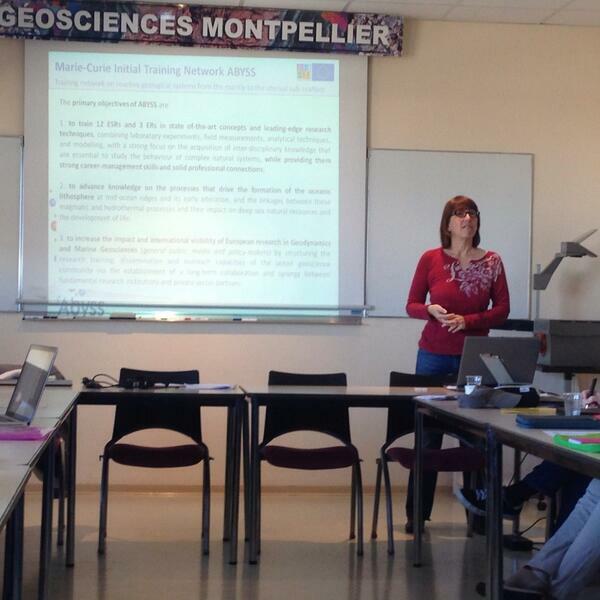 The ABYSS Kick-off Meeting was held at Géosciences Montpellier (CNRS) on 5-6 March 2014. This meeting was the opportunity to meet all the partners and to discuss the project in details: what we have planned, what is expected of us and how we envisage going forward.